"Excellent quality. All neatly rolled and stacked. Took 2 days to lay all the turves but even after a day and very windy weather the turf was still in good condition for laying. I have no doubt that it will root quickly. Very good delivery service. on time and good communication with palletways"
17th April 2019 - Judith Checkley, sale. First time laying a lawn? We put this tutorial page together to guide you through it step by step. A collection of useful lawn care tips to carry out in the spring months. A useful calculator to help you work out how much is needed for your gardening project. The good, the bad and downright ugly guide to garden pests and how to control and prevent the little blighters! Order Your Turf, Next Day Delivery! Bagged Top Soil, Next Day Delivery! To keep your lawn healthy, it is important to keep it well maintained and well fed! Keeping your lawn well fed will make it strong and more resilient to disease, pests, weeds, drought and other stresses, resulting in a lovely lush lawn to be proud of! 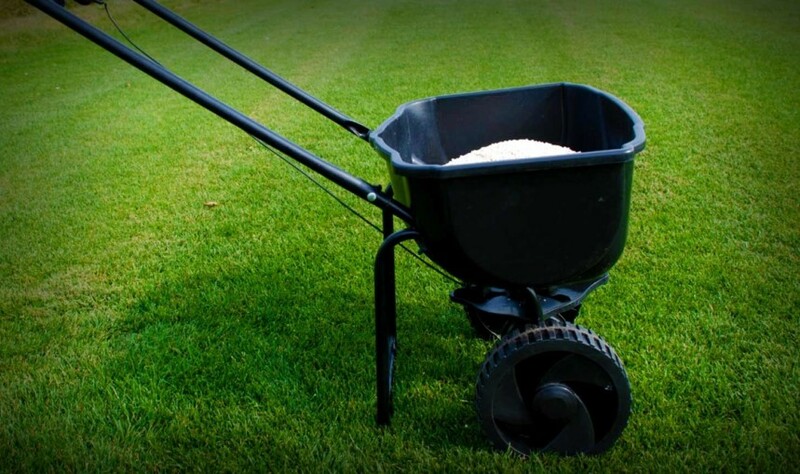 Knowing what type of fertiliser to use and when to use it can be quite confusing, so follow our tips below on fertilising your lawn so you can keep it healthy, strong and green. When laying a new lawn it is a good idea to apply fertiliser beforehand to get it off to the best start. Use a pre-turfing fertiliser in a granular or pellet form and scatter it onto the soil before hand. Follow the guidelines on the packet for spreading rate as over fertilising can have negative effects. Sprinkle the fertiliser onto the soil before laying the turf, and water well once the turf has been laid. Your turf supplier may provide you will a pre-turfing fertiliser to get you off to a good start. By keeping your lawn well fed throughout the year, you can always have a lawn to be proud of. Follow our tips below to keep it green and healthy all year long. After having a nice rest over the winter, your lawn will be ready to get going again as soon as spring comes around. By fertilising the lawn at this time, it will encourage strong and healthy root growth ready for the year ahead. Use a spring feed, or a combined spring weed and feed, to provide a good mix of essential nutrients. A good time to apply this feed is around the same time your lawn is due its first mow of the year. Turf can struggle in the hot weather during the summer months (if we’re lucky enough to get the hot weather that is!). By fertilising your lawn during the summer, it will help to keep it strong and resilient against the stresses of summer weather. Use a summer lawn feed to keep your lawn healthy as and when needed throughout the summer months. In autumn your lawn is still growing and after the stress of the summer months it will appreciate a bit of a feed. By fertilising now it will make sure your lawn ends the growing season healthy, ready to remain strong and resilient through the quieter winter months. Apply a winter feed towards the end of autumn and your lawn will be well prepared to get going again the following spring. There is no need to fertilise your lawn during the winter. Your lawn will be quiet and growing rate naturally slows right down – fertilising at this time would just encourage your turf to grow when it wouldn’t normally be growing anyway, so there is no need. Following the fertilisation above, your turf will be happy to have a rest over the winter and be ready to go again as soon as spring comes round. Which Nutrients is my lawn lacking? Nitrogen Deficient – Yellowing of older leaves, closely followed by yellowing of large areas. Phosphorous Deficient – Older leaves turn dark green closely followed by a purple discolouration. Potassium Deficient – Leaf tips tend to turn brown and dry up while leaf edges look burnt and brown. Calcium Deficient – This is very rare, but if present the youngest leaves turn a red-brown colour at the edges. Magnesium Deficient – Older leaves show a cherry-red discolouration. Browning and dying appears if the deficiency persists. Sulphur Deficient – Very rare, but if present leaves initially turn a pale yellow while the leaf tip and edges turn brown. Iron Deficient – Growth can slow significantly, and yellowing of the veins withing th leaves begins to show. Keep your lawn well fed throughout the year and you will have a lawn to be proud of. A healthy lawn will be strong and resilient and look top quality all year long! HouseFuel offers amazing discounts over traditional coal merchants. Struggling with your project? We may just have the perfect tutorial for you. All the information you need to maintain and repair your lawn in one great resource. Bored of reading? Prefer pictures to digest information? This section is ideal for you.